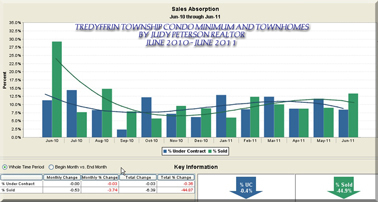 The Months Supply of Inventory was the highest in October of 2010 and down to a healthier 5.6 months in June of 2011. With all time low interest rates, the signals are good for buyers and investors to be in the market. *All data courtesy of Trend MLS and Terradatum is deemed accurate but is not guaranteed. Looking for an excellent Real Estate Photographer, need help to de-clutter and get ready for sale? Contact me, I Know Stuff! This entry was posted on Friday, July 29th, 2011 at 4:02 pm	and is filed under Chester County, Chesterbrook, Financial, Market Trends. You can follow any responses to this entry through the RSS 2.0 feed. You can leave a response, or trackback from your own site.